Promises of a glitch-free online admission process fell flat on Tuesday, day one of Delhi University’s undergraduate merit-based admissions. The university’s portal malfunctioned as the server crashed and several applicants had to return from colleges without completing admission processes. Certain colleges, like Sri Venkateswara and Kamala Nehru, also saw fewer admissions on day one because of the crash despite a large applicant footfall. 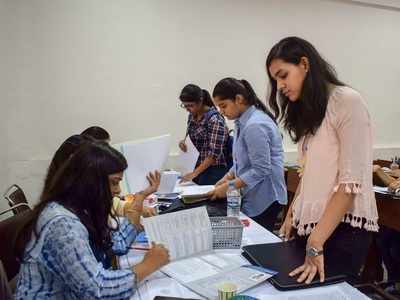 Several applicants who had come to DU after meeting the sky-high first cut-off had to return disappointed as they were unable to get printouts of the DU centralised admission form. Neeha, a student who had come from Calicut to Hansraj for admission, said she and her father had been trying since 7 am to open the portal and get the forms but couldn’t. Similarly, Hari Prasad of Salem also had trouble getting a printout of the form; he hopes to finish the admission process before his train back home in the next two days. The glitches also hit admission numbers on day one. At Kamla Nehru College, only 98 admissions were completed in comparison to 125 on the first day last year. The college administration portal blamed portal dysfunction squarely for the fall in numbers even though they had a large number of applicants ready to start the admission process. Similarly, only 42 admissions were made to Sri Venkateswara College, nearly half the admissions of the first day last year (78). Gargi College, too, recorded only 200 admissions this year as compared to the 300 made last year on day one, while Maharaja Agrasen recorded only 10 admissions, a fraction of the 40 the first day last year. However, some applicants were able to access the admission form, though at the cost of their sleep. “We stayed up all night and kept checking the portal for any updates,” said Aditi Ratwaya, an applicant to SRCC. We managed to print the form early in the morning and came straight to the university for admission,” she said. The admission help desks at the colleges also had their work cut out because of the portal glitches, each having to explain that admissions cannot go through without admission forms. However, considering that several parents had come from far away, the colleges asked the applicants to either stay in the college, complete the rest of the formalities related to courses and subjects and wait for the portal to start functioning, or go home and try accessing it again later in the day. Last year, too, the university had to face flak because of portal glitches the first day. This year, according to the DU administration, the high volume of traffic on the portal crashed the servers. “We had some trouble in the server till about 12.30-1 pm. We were not expecting this kind of volume where nearly 50,000 students were trying to access the portal simultaneously,” said Maharaj K Pandit, chairperson of the DU admissionscommittee. “But later we distributed the load to other servers which resolved the matter,” he added. He also claimed that the number of paid admissions this year have nearly doubled, touching 896 as compared to 440 last year. “We have almost 2,000 approved applications this year, almost double of what it was last year,” he added.